Nesco's American Harvest Food Dehydrator goes far beyond fruit roll-ups. The Gardenmaster FD-1010 can be used to dry fruits, vegetables, herbs, meat, or flowers. Talk about variety. Would Dad prefer salmon jerky or elk? How about a photo framed in dried pansies for Mom? You can dry herbs from your own garden to make them last all winter long. And yes, you can make fruit roll-ups for the kids. The Nesco Gardenmaster, a 1000-watt dehydrator, is super fast. Imagine dried apple rings in just three hours. Or beef jerky in four. An adjustable thermostat can be set to 95 degrees, 155 degrees, or anywhere in between. But how does it work so fast? A large fan forces air up through the drying tray's outer rings and across each tray. Each of the four plastic trays is 13-3/4 inches in diameter and 1/4 inch deep. That equals four square feet of drying space. But you're not limited to that. Additional trays can be ordered separately, and up to 30 trays can be used at once. A fruit roll sheet can be inserted into a tray so that fruit sauces can be dried for those famous roll-ups. Or you can use it to dehydrate soups and sauces for camping trips. No more baked beans and wiener dogs. 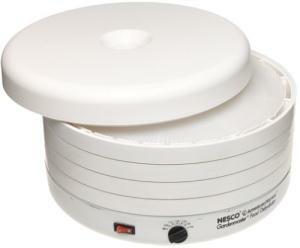 The Nesco FD-1010 comes with a 52-page recipe and instruction book, 1 solid sheet, 1 mesh sheet, 1 packet jerky spice, and a 1-year warranty against defects. Compare this with the Nesco Snackmaster dehydrator.